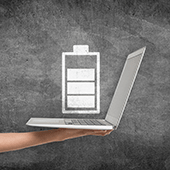 Tips for extending laptop battery life | CorCystems, Inc.
March 20th, 2019 CorCystems, Inc. If you want to use your laptop in an airport, a co-working space, or a cafe, the first thing you would look for is a power socket. If you are not lucky enough to find an available outlet, you'll have to depend on your laptop's battery (assuming it still has power after your last charge). The following tips should optimize your laptop's battery so it will last long.